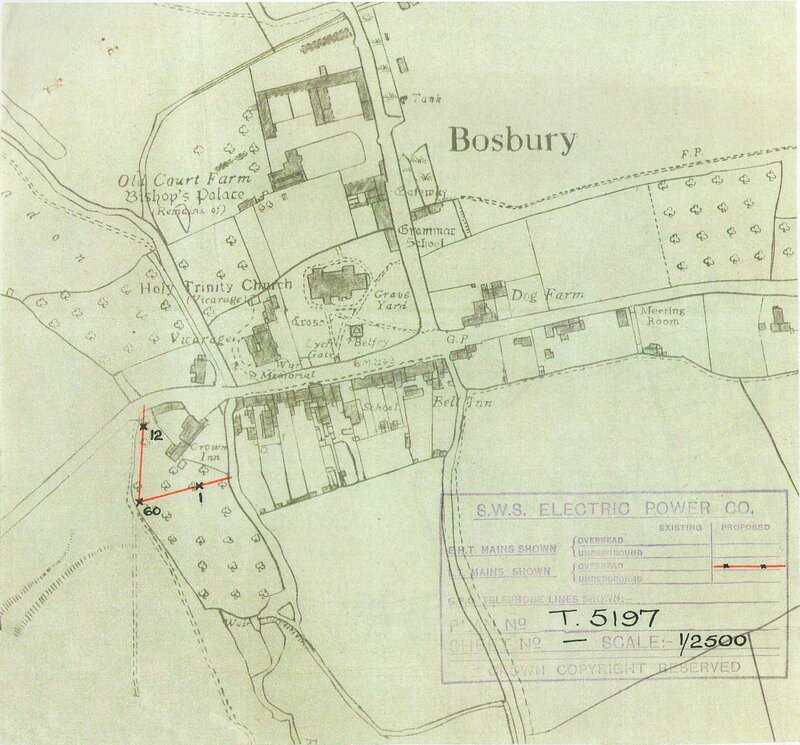 Summary: An agreement of wayleave dated 7th May 1945 between the Cheltenham Original Brewing Company, owners of the Bell Inn and the Crown Inn, Bosbury and The Shropshire, Worcstershire and Staffordshire Electric Power Company to erect Low-voltage power lines at the rear of the premises. (a) Erect wires and wooden poles with any necessary stays and appliances. (b) Erect wires and steel towers with any necessary appliances. (c) Lay underground cables with any necessary appliances upon over and through land owned by the Grantor in the position or along the route described in the first schedule hereto (subject to such modifications as may be agreed by the Grantor) and may from time to time maintain, repair, renew, inspect and remove same. (2) The Company shall pay to the Grantor a total yearly rent of £ - : 3 : 0 (THREE SHILLINGS) such amount being made up in accordance with the details set out in the second schedule hereto. The said rent shall be payable in advance on the First day of October in each year the first payment being proportioned from the date of commencing the authorized Work. Provided that should any alteration of route be effected, an addition to or reduction from such rent shall be made, based on the details in the aforesaid second schedule. (a) Carry out the Work in a firm and substantial manner in accordance with the Regulations prescribed for the time being by the Board of Trade or Electricity Commissioners and to the reasonable satisfaction of and with as little inconvenience as possible to the Grantor and occupiers of the land of the Grantor. (b) Make good to the satisfaction of the Grantor and occupiers of the said land — or pay compensation for any damage or injury caused by the apparatus or through the Company’s servants — any damage to fences, buildings, crops, live stock, the property of the Grantor or occupiers. Provided that notice of claim be made within one calendar month. In respect of Poles nos. 1 situated in orchard of Crown Inn, Bosbury, and 4 and 5 in land at the rear of the Bell Inn. 3 Single Poles at 1/- each 3s. 0d. A further pole (no. 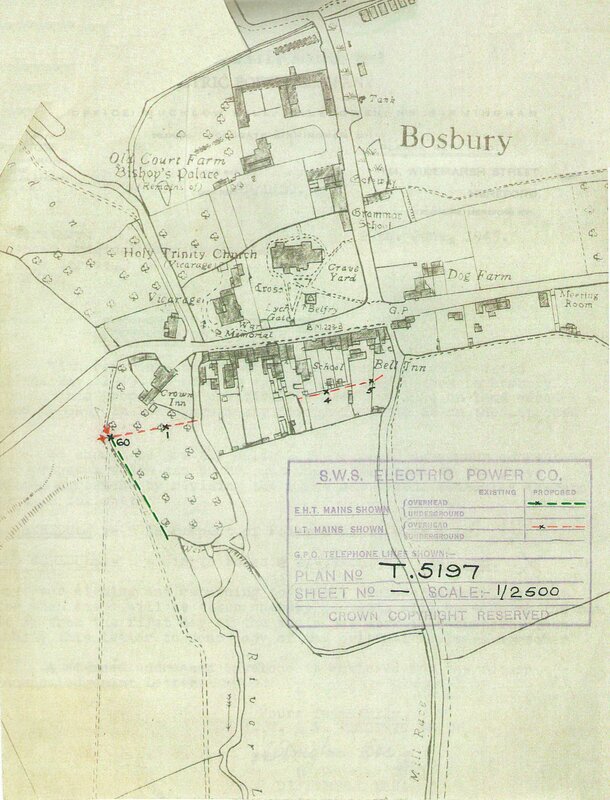 12) was added in a letter dated 29 June 1945.